Shane Robinson hasn’t gotten a lot of attention this season, and probably rightfully so. He hadn’t done much, hitting just .100 before he was sent to Memphis in late April and, now that he was recalled this week, flying out as a pinch-hitter on Wednesday night to drop his average to .095. 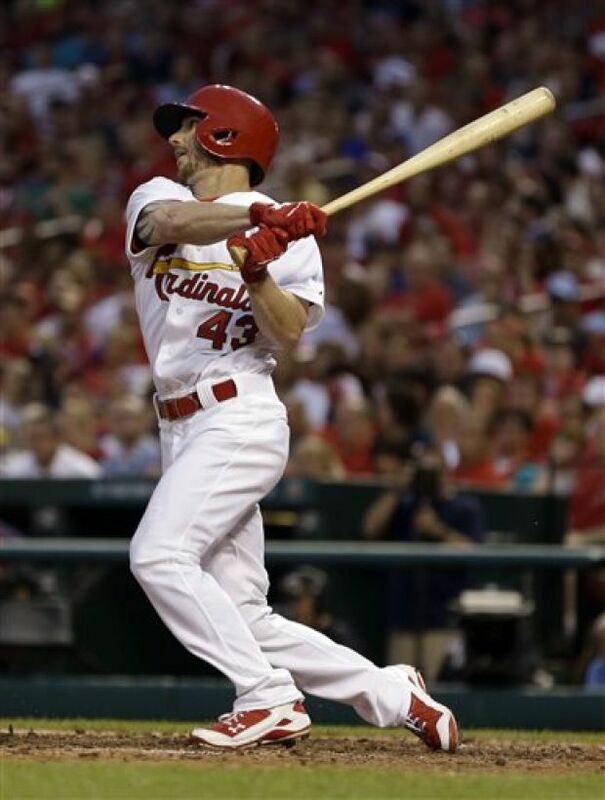 Robinson started in right field (with Allen Craig at first and Matt Adams getting a day off) and definitely made a big impact: three hits and two RBI that tied the game in leading the Cardinals to a 4-2 win and sweep of the Diamondbacks. He also scored the final run of the game on Matt Carpenter’s RBI single. Great to see for Shane? Definitely. Plus his success — two singles and a two-RBI double — boosted his batting average all the way to .200. Progress! Also great to see: Allen Craig driving in the go-ahead run in the seventh, after he singled in the sixth. Craig still isn’t the Craig we’ve gotten used to, but he’s showing signs at times. Progress! Plus all four runs by the Cardinals came with two outs. With those, the Cards as a team are now hitting .217/.320/.343 with two outs and runners in scoring position and .235/.322/.334 with RISP overall. Progress! With just two runs allowed, the pitching obviously went well — although you certainly wouldn’t have known that if you glanced at Twitter during the first inning, when Lance Lynn allowed two runs on three hits and a sacrifice fly. Calamity! Lance Lynn is the worst! OMG! Release him! They’re doomed! Lynn did allow four more hits, though no more runs, and struck out six. And by the fourth inning or so, the overreacting Twitterati (which may be a redundant phrase) had moved on to bashing the offense. Calamity! They’re the worst hitters! OMG! Release them all! They’re doomed! Pat Neshek took over for Lynn in the seventh and pitched the eighth as well, allowing just one hit while striking out two. It was his 18th straight scoreless outing. And Trevor Rosenthal once again looked more like the Trevor Rosenthal of old, needing 11 pitches to retire the side in the ninth for his 14th save and the Cardinals first sweep of the season. The victory — the Cards seventh in their last eight games — and the Braves win over the Brewers means the Cardinals are now just 1 1/2 games back in the NL Central and a season-high five games over .500. Progress! The Cards now have a nice weekend jaunt to Cincinnati on tap for a series of night games, including Sunday night on ESPN for the third time in four weeks. Tonight’s game is at 6:10 p.m. Central Time, with Shelby Miller facing Homer Bailey. This entry was posted in 2014 Cardinals and tagged Allen Craig, Arizona Diamondbacks, Lance Lynn, Matt Carpenter, Pat Neshek, Shane Robinson, Trevor Rosenthal by Christine Coleman. Bookmark the permalink. Ya I would have to agree with you about Shane there is progress. But Allen Craig has got me worried, showing signs yes. Bit I feel like his mind is just not focused of just not all the way in it. Its disturbing to me. I have the same feeling for Big City its like they lack concentration. At first I thought it would come back in time now I’m a little worried… Go Cards! I have been plenty worried about Craig, but the fact he *can* still look like the Allen Craig of 2013 and before at times has me encouraged. Adams — yeah, I do agree with you there. Ya I’m with you, only time will tell.